Chemical biology aims at an external control of cellular processes, e.g. protein-protein interactions, without substantial perturbations on function, dynamic or localization of the target biomolecule. Since the cellular logistic of living systems is strictly organized in time and space, an ultimate goal is the spatiotemporal tracking and manipulation of specific targets. We are developing ultra-small lock-and-key interaction elements, which can be activated by light. This bioorthogonal trigger allows the dose-dependent three-dimensional assembly of macromolecular complexes and networks with high spatiotemporal resolution. 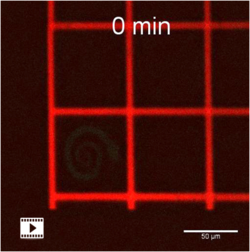 In addition, our minimalistic lock-and-key elements are beneficial for super-resolution microscopy, single-molecule tracking (uPAINT) and other emerging techniques. The assembly of biomolecules is a fundamental process in cellular logistic to trigger signal cascades. Our nanobiotechnology approaches aim to establish supramolecular scaffolds for the controlled organization of biomolecules in order to study the assembly process at the single-molecule level and in real-time. Here, we develop two- and three-dimensional frameworks to immobilize and organize functional biomolecules in an oriented manner for their analysis by state-of-the art techniques and whenever possible in living organisms. Membrane proteins are prime drug targets as they control the transit of information, ions, and solutes across membranes. The requirement for high throughput screening applications in the development of novel pharmaceuticals is evident; however, membrane proteins have persistently evaded efficient analyses due to the lack of suitable techniques as well as major challenges with regard to their fragile properties and low abundance. Techniques to investigate ion channels and pumps are available, but membrane transporters without electrogenic activity can’t be studied this way. Complementary techniques are sought to overcome this issue. In collaboration with the W. Schottky Institute at TU Munich and an industrial partner, we have developed highly multiplexed chip-based systems for optical analysis of membrane transporters. 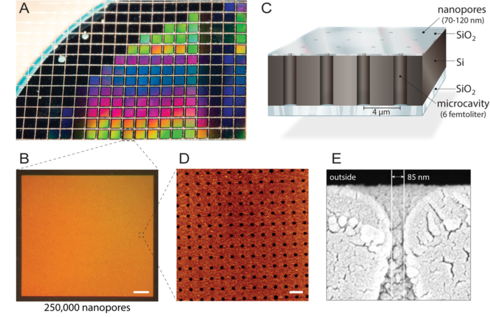 Different designs consist of up to 250,000 nanopores per chip that are sealed by a solvent-free pore-spanning lipid bilayer. All pores are individually connected to femtoliter-sized compartments, in which fluorescent substrates are transported by membrane proteins. The optically transparent bottom of the chip allows for direct observation of the compartments’ internal volume, and up to 9000 compartments can be simultaneously analyzed in the same field of view. Design of multiplexed nanopore biochips. A) A silicon-on-insulator (SOI) wafer is structured by reactive-ion etching. Approximately 1,150 individual chips are fabricated from each wafer with identical properties and quality. B) Each chip comprises 250,000 individual microcavities with nano apertures. 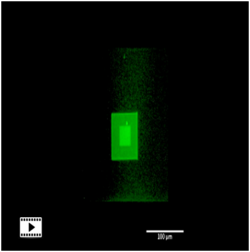 Scale bar: 200 µm. C) Each cavity is addressable via multi-spectral fluorescence read-out. An intransparent top layer blocks the fluorescent signals from the buffer reservoir, making the biochip compatible with inverted fluorescence microscopes. D) Atomic force microscopy (AFM) imaging reveals evenly arranged pore openings and surface roughness of the silicon dioxide layer of 3.6 nm (n = 40) optimal for vesicle fusion. Scale bar: 5 µm. E) Scanning electron microscopy (SEM) image shows a cross-section through the nanopore allowing access to the femtoliter cavities inside the silicon chip. Wieneke R, Laboria N, Rajan M, Kollmannsperger A, Natale F, Cardoso MC ,Tampé R.
Gatterdam V1, Ramadass R, Stoess T, Fichte MA, Wachtveitl J, Heckel A, Tampé R.
Three-Dimensional Protein Networks Assembled by Two-Photon Activation. Wei R, Gatterdam V, Wieneke R, Tampé R, Rant U. Stochastic sensing of proteins with receptor-modified solid-state nanopores. Gatterdam V, Stoess T, Menge C, Heckel A, Tampé R. Caged Glutathione: Triggering Protein Interaction by Light. Grunwald C, Schulze K, Giannone G, Cognet L, Lounis B, Choquet D, Tampé R.
Quantum yield optimized fluorophores for site-specific labeling and super-resolution imaging. Giannone G, Hosy E, Levet F, Constals A, Schulze K, Sobolevsky AI, Rosconi MP, Gouaux E, Tampé R, Choquet D, Cognet L. Dynamic superresolution imaging of endogenous proteins on living cells at ultra-high density. Grunwald C, Schulze K, Reichel A, Weiss VU, Blaas D, Piehler J, Wiesmüller KH, Tampé R. In situ assembly of macromolecular complexes triggered by light.